Last weekend when we had our karaoke party at Cindy's I volunteered to bring a dessert. I scrolled through my pinterest boards for ideas but a tiny voice in my head told me what I really wanted to make. Long ago in the early days of the internet, before there was pinterest, there were newsgroups. Remember those? I followed several recipe groups and when something looked good I would copy the recipe and paste it into one of several .txt documents I kept on a floppy disk. I still have that floppy somewhere, but along the way I printed out the following recipe on the school's dot matrix printer (hush) and saved it...but never got around to actually making it. This is a tragedy, really, as well, it was a little piece of heaven that really should have been enjoyed back when my metabolism was much faster. And, of course, the recipe. I didn't save the source, but there's a line that says "These are Grant's famous brownies that everybody loves!" Whoever you are Grant, wherever you are...THANK YOU!!! Mix together the flour, baking powder and salt. Add the melted butter and stir in the cocoa. Blend in the sugar, eggs and vanilla. Pour batter into greased 9x13 pan and bake @ 350F for 30 minutes (heating times may vary). Cool and put topping on. **You could use your own brownie recipe if you want. This one was REALLY dense and fudgy, but it balanced out the topping well. Just put the 1st 2 ingredients in a bowl and mix them and add icing sugar until you like the taste of it (I used about 3 TBSP). Spread on top of cooled off brownies. Pour can of cherry pie filling over cream cheese mixture and spread on top. Chill and serve! Shared because I love you. Or I hate you. Honestly, your mouth will thank you, your thighs will weep. Make at your own risk! Another weekend, another bucket list item! The kids were quick to include a Karaoke Party with our friend Cindy on their list. We've had a few fun ones in the past and they couldn't wait to do it again. It turns out she couldn't wait either; she just moved into a basement apartment and the upstairs tenants will be moving in at the end of the month, so if we wanted to make lots of noise we needed to do it soon! We made a plan to get together after church on Sunday (we don't usually dress this well for karaoke) and pooled our resources for a really yummy lunch. ...but not as much as her Dad! ...snores started drowning out the singing! When we tired of Karaoke we had a Bohnanza smackdown. SOMEONE stabbed me in the back and won the game by clever stealing of MY cocoa beans! Claims he found a loophole in a previous agreement. Traitor! We had a great time! Thanks Cindy! Next time we'll have to have her out to our place so we don't disturb her neighbours...but there will definitely be a next time! It's the final week of school and we're stretching our way toward summer. We're still crazy busy, but this weekend we were able to cross a couple of big things off of our bucket list. I'm going to share them slightly out of order because...um...I took 700+ photos of all our fun on Saturday, and it's going to take me bit to sort through them and decide which are keepers and then which I want to share. Sunday was Father's Day though, and yesterday was Hubby's birthday. We basically call this Dad Weekend and we do whatever Hubby wants. It's also our unoffical summer kick-off; we feel like it's time to get serious about summer fun when Dad Weekend comes. For his actual birthday our family tradition is to have a picnic. No matter what, every year, his birthday, PICNIC. It's law in these parts. This year, not for the first time, our picnic ended up on the living room floor due to rain. Our spirits were not dampened though, indoor picnics are great--NO BUGS! This year we did a lemon "Graduation Cake", as my mom always called it. I think on Pinterest it's more commonly called "Poke Cake". You make your basic cake, poke it full of holes, pour jello in the holes, chill, then cover with a pudding layer and finally a whipped cream layer. It's a nice summer cake, and I loved the lemon (the kids weren't as excited, but Hubby chose the flavour). And here's the Birthday Boy, being silly while we sing. PS. 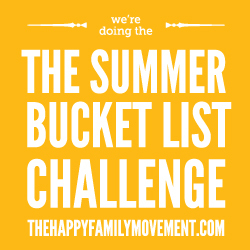 If you would like to join the #happyfamilysummer fun, there's still lots of time to sign up and start your own summer bucket list! Things have gotten pretty busy around here and the busier it is the harder it is to blog. Even though we've already crossed a couple of things off of our Summer Bucket List, summer isn't ACTUALLY here yet. For one, it's been cool and rather rainy of late. For another, school isn't out until the end of June. Right now 'tis the season of Enrichment Presentations, Drama Productions and, naturally, field trips. Last week the Grade 4's got to go on a field trip...and I was happy to tag along! Sweetpea sat behind me with one of her friends (but she saved me a seat). This year's field trip was to Mactaquac Provincial Park and was lead by Ducks Unlimited, with some helpers from the park. Here we are being welcomed and getting some ground rules. I have to tell you, my Dad was a member of Ducks Unlimited when I was a kid and they never had cool pink hats! Love the direction they've been going (education, conservation). Shortly after arrival the two classes split up. Sweetpea is in the french class but the English class didn't have any parents with them so I was asked to stay with them for a bit. I managed to snap a shot of her class learning about different types of wetlands before sticking with the other class for a while. With the English class we had a little chat about what wildlife we might see in the park, then we all got binoculars (I stuck with my camera but switched to the long lens) and went for a quick hike around the Beaver Pond Trail to do some bird watching. After watching the E's dip for a bit and getting some good photos I was given permission to slip off to spy on Sweetpea (there was lots of supervision). Her class was back on the trail at this point, doing their own bird watching. At one point on the trail I could actually see both classes. It made for good photography too! They wanted to share their discoveries with each other, but it was time for the English crew to head up to the field to play some games and the French group to have their turn dipping for critters. Lots of critters were found, but the most exciting catch of the day was this tadpole, which was actually caught by both classes (they released all the critters after the first class and the second class promptly recaptured the poor thing). After the dipping and the games it was sadly time to head for home, but we had a great day. Sun shining, hardly any bugs, beautiful sights. Yay field trips! Heat Wave = Ice Cream! Earlier this week we had a frost that killed my marigolds. Yesterday it was 32C and the humidex was 37C. Given the sudden suffocating heat and the sticky humidity, I wasn't in a cooking mood. Perfect time to cross Ice Cream for Dinner off of our bucket list! Here's our spread, ready for hot, greedy people. I put the camera away after this, because ice cream, but it was delicious and cooling and oh, so sweet. And the best part? I didn't feel guilty for not making something nutritious (hey, there were fruit and nuts as topping options) because we were crossing off a bucket list item. Our #happyfamilysummer is shaping up to be spectacular!